With their alliances and partnerships, NGOs could be environmental kingmakers. Facebook seemed so frivolous when it first emerged 15 years ago, but look at it now: this glorified chatroom has completely upended the very sector it seemed destined to complement, becoming in the process the epitome of a “disruptive technology”. Lyft and Uber have since done the same to the sector formerly known as “taxis”, while Venmo is doing it to payments and money transfers. As we pondered the impacts of technology from discussions at the recent Global Climate Action Summit in San Francisco – Silicon Valley’s corporate tech-hub sister city, held on 12-14 September 2018 – we couldn’t help but notice that something similar is happening in the environmental arena as well. 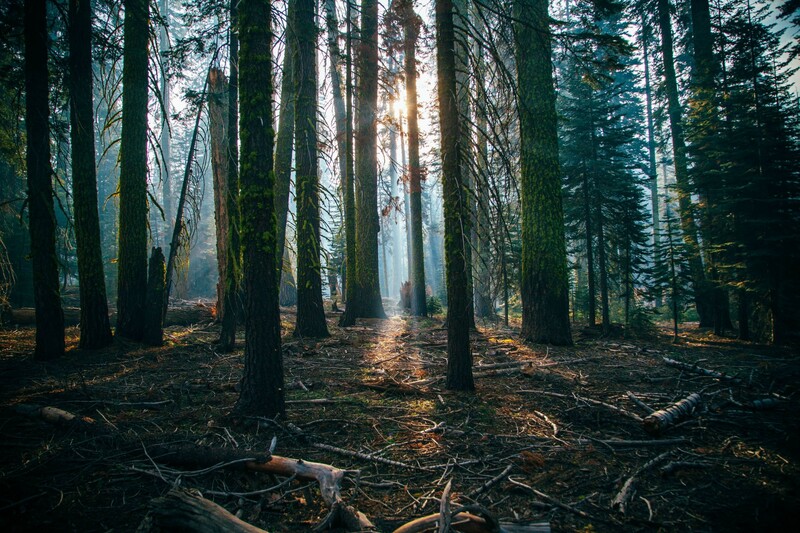 At the World Economic Forum’s Fourth Industrial Revolution for the Earth: Sprint to 2020 event, the “Forests and Land Use” session was especially significant in exploring how new, supportive enviro-technologies and practices are turning existing approaches upside down. Many, it turns out, are showing signs that they will forever change the way we conserve forests and sustainably manage land. “If we connect the information we have, and how we need to make decisions at the high level in public policy and work on the ground with the small producers and local government, I think technology is going to be really useful for us,” said Peruvian Environment Minister Fabiola Muñoz during the session. Satellites and drones, for example, were first deployed to monitor forests, but now are used to actively manage them, thanks largely to recent advances in artificial intelligence. Environmental NGOs such as the Forest Trust are working with technology groups like Airbus to monitor corporate impact on forests in near real time. 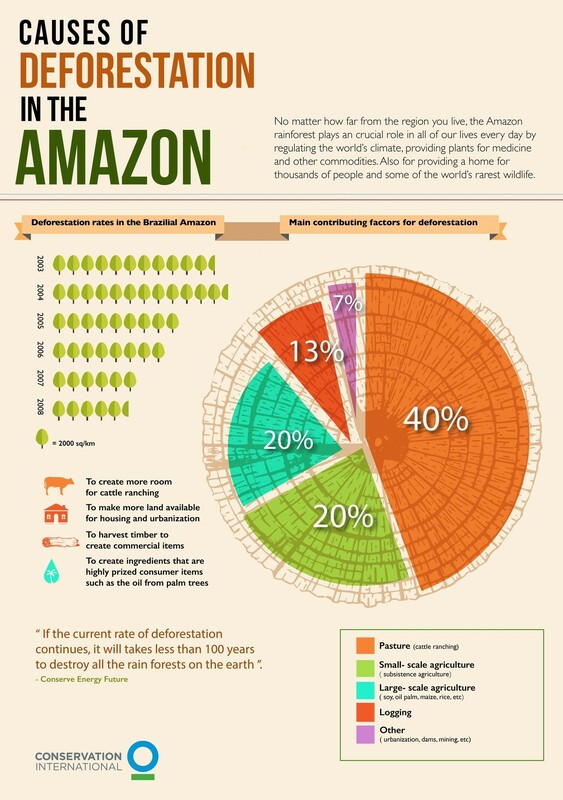 An infographic showing the causes of Amazon deforestation. These new technologies could dramatically improve transparency and accelerate our effort to slow climate change by saving woodland. To do so, however, they must reach beyond the gaggle of early adopters and spread out to governments, landowners and corporate actors around the world. Ironically, it’s civil society organizations, and not technology providers themselves, who are best positioned to drive this uptake – largely because they’ve spent decades building alliances and partnerships with these very actors. These NGOs, long dependent on donors for support, could become kingmakers, or at least subsidize their operating costs by acting as trusted intermediaries and partners. Forest Trends’ Supply Change initiative tracks nearly 800 corporate commitments to address loss of trees associated with the “big four” deforestation commodities – soy, palm oil, cattle and pulp and paper – and we decided to poke around to see how some typical commitments might translate into demand for supply-chain technologies and to match these with potential suppliers. We profile hundreds of major companies that have made concrete commitments around the “big four” commodities. Often, these commitments include specific measures such as monitoring the company’s impacts on forests or tracking specific commodities to their point of origin. We monitor companies’ commitments and their reported progress towards achieving them, both at the general and commodity-specific level. As corporate commitments have come into focus, we’ve seen the emergence of clear needs, both for the “raw” technologies as well as for organizations to partner with tailored services that integrate technologies. More and more companies are promising to monitor and report their direct impacts on specific forests, and several efforts have emerged to meet that need. The Woods Hole Research Centre’s Carbon Monitoring System, for example, provides detailed analysis of forest biomass and carbon sequestration, while Airbus-Starling is a collaboration between the aircraft maker Airbus, the Forest Trust and radar satellite imagery group SarVision that helps companies like Bunge monitor deforestation in their supply chains. Then there’s Microsoft, whose AI for Earth project grants cloud space and artificial intelligence capabilities to schools and civil society organizations engaged in environmental issues. A number of other companies are reporting that they do this using various methods across different commodities – from Sime Darby Plantation, which has launched Open Palm, an online dashboard that provides critical information on the traceability of its supply chain, to Asia Pulp and Paper, which has its own monitoring platform, to JBS, which has developed a system to use satellite imagery, farm geo-referencing data and information from government agencies. Just under half (44%) of the companies tracked by Supply Change have made statements of some degree of traceability intent, whereas only 20% of companies have made clear and actionable commitments to carry out traceability. Ikea, for example, works with the Rainforest Alliance SmartWood Programme on ensuring traceability for suppliers and sub-suppliers. And while companies such as Unilever and Neste Oil have done quite a bit to be transparent on where and from whom they source from, progress has been slow – in part, we hear, because supply chains are complex, and traceability is easier imagined than implemented. Two high-profile initiatives aim to change that. Global Forest Watch Pro keeps track of deforestation in around agricultural concessions over time and makes that data freely available; Cargill and the Aqueduct Alliance are two partner companies. There’s also TRASE, which uses warehouse receipts to follow the flow of commodities from specific jurisdictions in exporting countries, through traders, overseas and to ports of call. More than 100 of the commitments that Supply Change tracks aim to address deforestation by helping farmers improve their practices. Efforts to speed that process by funnelling investment into sustainable farming projects in and around tropical rainforests organizations are being introduced by new accelerators around the world. The Nature Conservancy, for example, together with a group called Techstars, have launched the Techstars Sustainability Accelerator to identify and nurture green entrepreneurs – something a group called ECOSTAR is doing as well. Golden Agri-Resources has trained smallholders with its research and development arm, SMARTRI, and has monitored deforestation with satellites, radar and company-owned drones. Finally, dozens of companies have vowed to restore land that their policies have previously degraded, especially in the palm oil sector. Such activities drive a restoration economy valued at over $25 billion in the United States alone, where it employs more than 220,000 people. On the technology front, the Land Life Company says its new GPS-guided technologies can help restore degraded forests at a fraction of current costs, while a firm called BioCarbon Engineering says its drones can use “seedpod” tool to drop a billion seedlings into the earth every year right now – and 500 billion by 2060. Will it work? We won’t know until we try, and we can’t try it right until we’re thinking systemically – which is exactly what the most effective environmental NGOs have already done so effectively. We need them on board – both as facilitators and as filters.